Class 2 Safety Vest is perfect for surveyors with four convenient pockets and high visibility. Pockets include front radio pocket with flap, two large interior pockets and a pencil pocket. 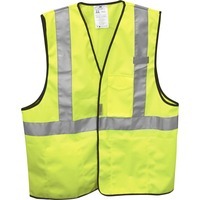 The HiViz yellow safety design is equipped with 2 3M Scotchlite reflective material for 360 degree reflective visibility. Safety vest meets ANSI 107 2004, Class 2, FHWA. Size adjusts so one size fits most.